UP-B200: Here is a unique design from the land down under. We call it the Aussie. This has a by-pass cutter that can cut up to 50-pair communication cable. 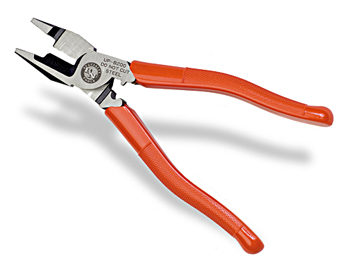 The pliers tips will actually meet to grip and hold the smallest wire and there is a built-in crimper. Made from drop forged tool steel and heat-treated for long life. Heavy duty orange plastic handles. The overall length is 8½”. Not designed for cutting steel or ACSR materials. Quality hand tools to save money, make money or add value. . . by Benner-Nawman, Inc.